A surprisingly refined, fresh aroma with bitter-sweet sensuality. Italian licorice toothpaste created in collaboration with Amarelli. 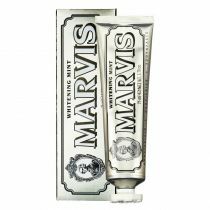 Amarelli Licorice Toothpaste by Marvis combines the clean, seductive flavor of liquorice with the freshness of mint. 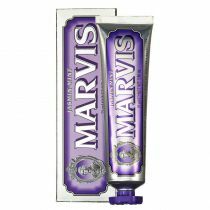 The result is a rich, creamy toothpaste that offers a tingling sensation and removes plaque and tartar for a sparkling white smile. 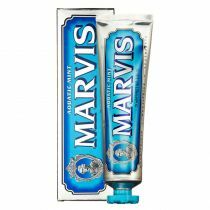 And like all Marvis toothpaste flavors, Marvis Aquatic Mint comes in a distinctive, display-worthy tube that makes the perfect bathroom accessory. I bought the sampler pack to try each flavor and I actually started with the licorice one because I figured it would be my least favorite, so I would get it out of the way. I was so wrong - it turned out being my favorite! I would agree with the other reviewer - if you're a licorice fan, you must try this. HOWEVER, even if you're not a licorice fan, I recommend it. It has a very subtle yet distinct flavor and is so refreshing and really deep cleans. If you are a black licorice fan, you need to buy this toothpaste. So Good! Black Licorice with refreshing mint added in. This toothpaste makes me want to keep brushing, it's that good! It has become my favorite toothpaste. 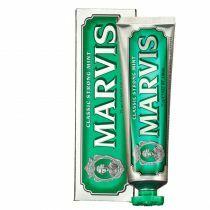 I love this toothpaste so much, I never want to go back to any other type. It's so fresh !